When getting group shots of the groom and his groomsmen, I try my best to look for areas that appear to be more rustic and masculine, rather than a backdrop of tree blossoms or flowery gardens which would be more suited to the bride and her bridesmaids. With the men looking dapper in their suits, I try to find a place that I can pose each of them at different levels and angles. When searching for these unique shooting sites, natural landscapes and the outdoors play a big part in creating these scenes. This classy and gallant photo was shot along the waters edge in Mississauga, located in the scenic province of Ontario, Canada. 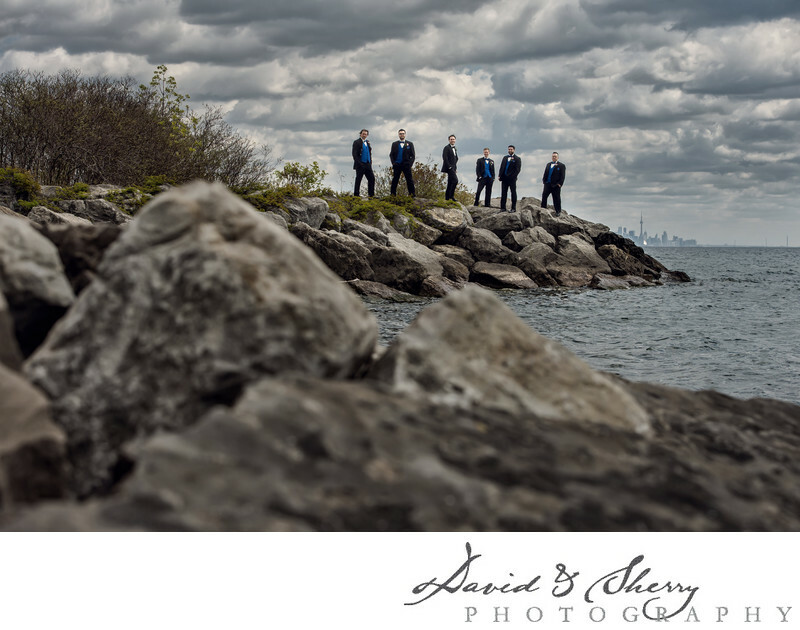 Mississauga is situated along the water and is a beautiful city with a range of sites to photograph gorgeous weddings. This wedding day in particular was quite cloudy and windy, but the grey clouds overhead added texture and moodiness to the image. The rough rocks and boulders along the lakeside were a similar dark grey colour as the men’s suits and the stormy sky above. I always feel accomplished getting an awesome wide shot of the groom and groomsmen, especially one that features a neat background and attractive setting.